There is a ring of muscle at the top of the stomach. This is a valve, which should close when feeding has finished. When a baby has Gastric Reflux this valve doesn’t close properly. The contents of the baby’s stomach (food and digestive acids) are brought up/regurgitated. These contents come up the oesophagus and may be vomited or spill out through the baby’s mouth. The acid can burn and may cause the baby discomfort and/or pain. Adults often refer to gastric reflux symptoms as indigestion. As the child matures so does the valve/ring of muscle at the top of the stomach. Generally speaking, the more upright the baby is the more the reflux decreases. By the time the baby is walking reflux will often have disappeared. In some cases it will improve over a longer period of time. 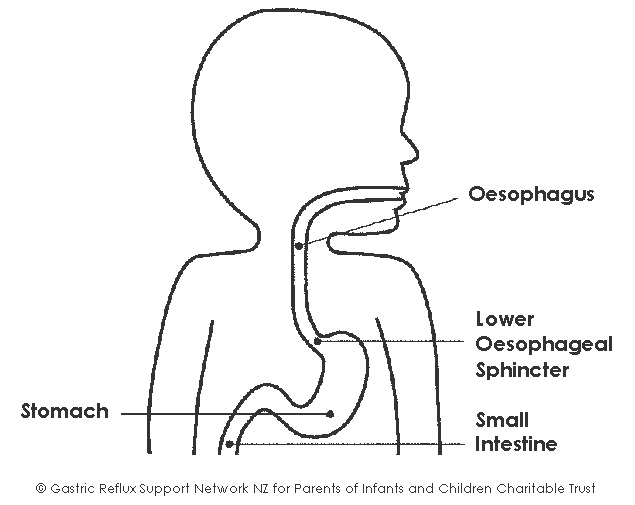 Gastric reflux in infants is common, and most infants have some degree of reflux at birth. Babies often spill a little after feeding and this is quite normal. Most babies feel full and contented but a baby with Gastric Reflux Disease (gastric reflux that causes problems) is often uncomfortable and unhappy. Not all cases of Gastric Reflux Disease will need medical treatment and there is a move away from prescribing by many Health Professionals unless there appears to be significant pain, severe complications, growth issues or difficulties feeding. Surgery is generally only considered if Gastric Reflux Disease is not able to be controlled with medication. Reflux is variable and unpredictable. Some days may be much better than others are. Some babies vomit up part of every feed. Sometimes this continues for several hours, and may cause the baby discomfort/pain. Some babies rarely vomit at all, but their feed will come part way up their oesophagus and then go back down again. This may cause pain. Written by Jennifer Howard, National Coordinator 2001 – 2013 and Roslyn Ballantyne (RN), National Coordinator for © Crying Over Spilt Milk Gastric Reflux Support Network New Zealand for Parents of Infants and Children Charitable Trust 2004. Updated February 2014.